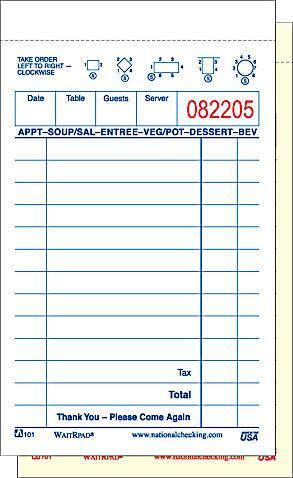 Details: Single board green GUESTCHECK™(3.50" x 6.75") has 15 lines with a Menu Prompt for better customer service. 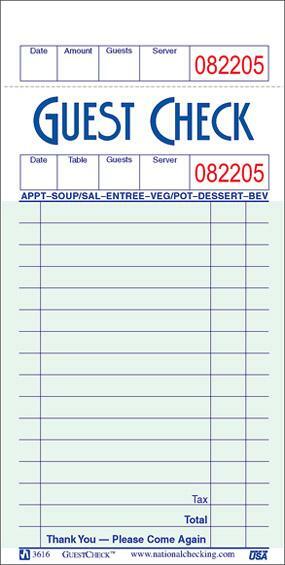 Lined back copy for beverages and a perforated receipt for the customer's record. 50 checks per book / 50 books per case. 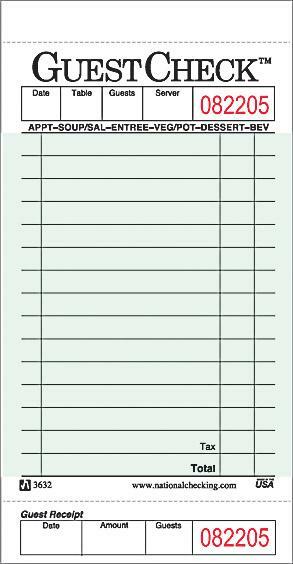 Details: Single paper green GUESTCHECK™(3.50” x 6.75”) has 16 lines with a “Menu Prompt” for better customer service. A numbered receipt stub is used for accounting purposes. 100 checks per book / 50 books per case. Details: Duplicate paper, carbonless white WAITRPAD(3.40" x 5.63") has 13 lines with a Menu Prompt for better service. Original copy is printed in black and the duplicate in red. Cardboard wrap-around cover prevents multiple copy write-through. 50 sets per book / 100 book per case(shrink packed 10 bundles of 10 books).